GRAFENWOEHR, Germany — U.S. Army Garrison Bavaria honored four Soldiers and one civilian for their service and career at the quarterly retirement ceremony, here, December 12. The USAG Bavaria Garrison Commander, Col. Adam J. Boyd, thanked the retirees for their accomplishments and sacrifices made in service to the country — in both times of peace and conflict. “These tremendous patriots have made great sacrifices as they served our nation, both in times of peace and in times of conflict” said USAG Bavaria Garrison Commander, Col. Adam Boyd. Lt. Col. Brandon J. Iker joined the Army a 11A infantry officer. completed officer basic training at Fort Benning, Georgia. He is a graduate of the united states military academy at West Point, New York, the infantry captains career course. And the command general staff college at Fort Leavenworth, Kansas. Lt. Col Iker has been married for 19 years to his beautiful wife Anna. Chief Warrant Officer 4 Julius J. Clark joined the Army in 1995. He became a 27T Avenger weapons system repairer in 1996. He has served the military for faithful for more than 23 years. He has been married for 18 years to his wife Yvonne together they have two children. Chief Warrant Officer 3 Patrick Waters joined the military in 1994 as a 13B Cannon crew member. He attended warrant officer basic course in 2007. He graduated from the warranted officer advance course in 2010. He has served the military for more than 24 years. 1st SGT Ambar S. Yenz began his career as a 63W wheeled vehicle mechanic in 1997. He has served the military for more than 21years of service. He was honored with the meritorious service medal. His wife Irina of 12 years and his two children joined him at the ceremony. Ms. Kathleen Connolly entered into government service in 1971. She joined USAG Bavaria in 2014 from Joint Base Lewis McChord, Washington. Ms. Connolly oversees the management of the college programs, computer labs testing programs basic skills program, budget Army tuition assistance and administration that supports the Army continuing education total program and services worldwide. Ms. Connolly has been honored with the department of the Army achievement medal for civilian service and the department of the Army commander’s award for civilian service. She is married to Lt. Col. retired Kenneth A. Zych. 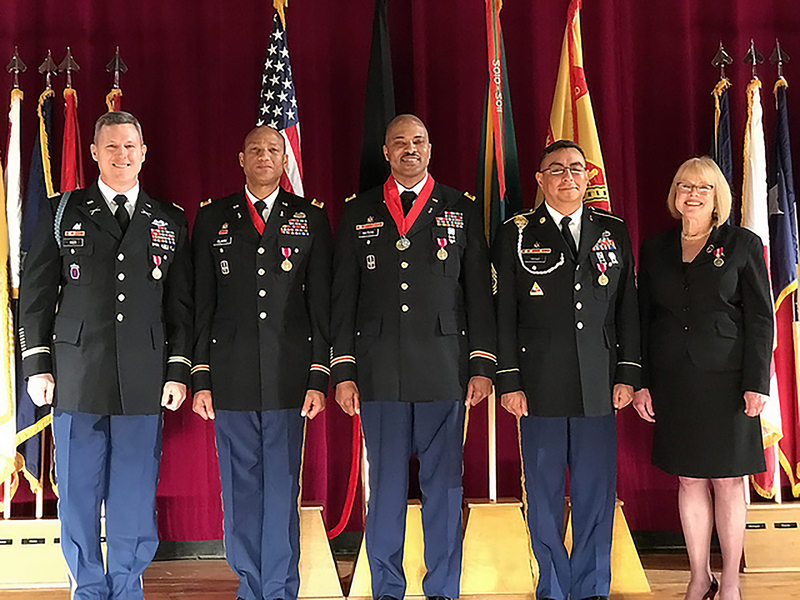 Combined, these four Soldiers and Ms. Connolly rendered more than 136 years of service.